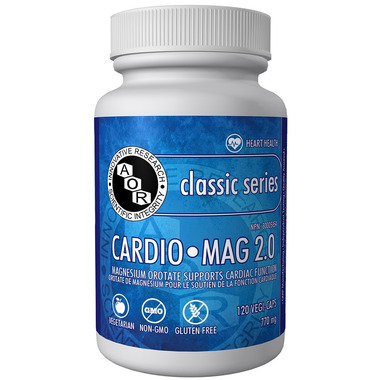 AOR Cardio• Mag 2.0 is true magnesium orotate, and supports cardiac function under stress. Magnesium and orotic acid exert complementary effects on the biosynthesis of pyrimidine nucleotides, supporting the heart's ability to endure and recover from chronic and acute stressors through the maintenance of normal glycogen stores, protein synthesis, ATP levels, and contractile function. Research supports the ability of true magnesium orotate to support cardiac function. The magnesium orotate in AOR's Cardio•Mag 2.0 is fully-reacted, unlike most "magnesium orotate" products which are food-grade mixtures of orotic acid with inorganic magnesium salts. Adult Dosage: Take 1 capsule four times daily with food, or as directed by a qualified health care practitioner.